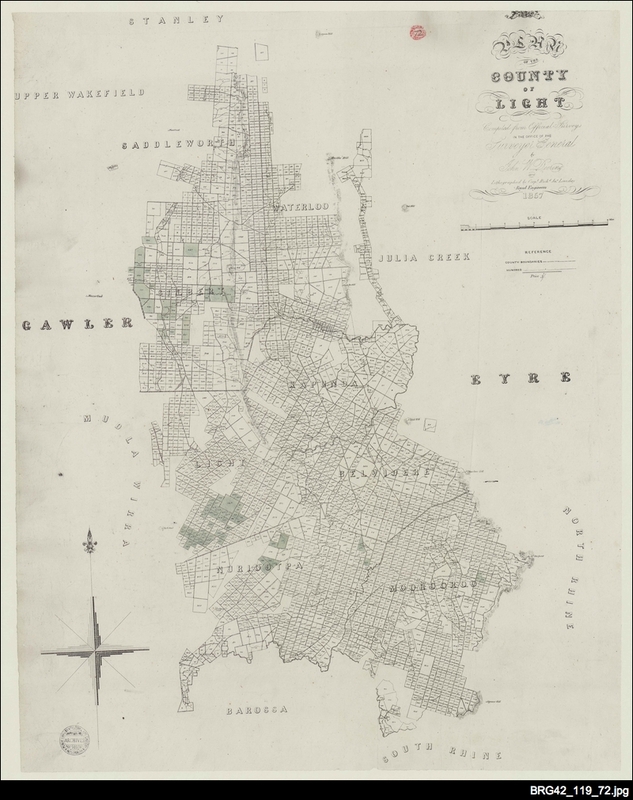 To assist with the regulation and administration of land transactions in South Australia (that is, for cadastral purposes), counties and hundreds were established. Under the principle of concentration, new hundreds were usually proclaimed adjoining existing ones. Land could only be purchased in proclaimed areas, so as the demand for land grew, new hundreds were declared. Within each hundred the land was surveyed into sections which were then offered for sale. The first hundreds were proclaimed in 1846. In 1853 the Hundred of Murray was proclaimed. The boundaries extended two miles each side of the Murray River and included land around Lakes Alexandrina and Albert. In 1860 this hundred was annulled and many new hundreds were proclaimed covering a wider area around the River. The name Murray was re-used for one of these. In 1870 four of the previously proclaimed hundreds, Murray, Randell, Cooper and Giles, were "cancelled and annulled". These areas were later incorporated into other new hundreds. Three of these names were later re-used; in 1888 Murray in County Robinson, in 1890 Giles in County Kintore and in 1895 Randell in County York. The other major change was the re-naming in January 1918 of ten hundreds whose names had German association (see article: German place names). The Hundreds of North Rhine and South Rhine became Jellicoe and Jutland. The hundred named for the first director of the Adelaide Zoo, Richard Moritz Schomburgk, was re-named Maude. Other hundreds, which originally had been named for members of parliament who happened to be of German heritage, were given names of British World War I leaders. Up to the present day, only the south eastern portion of South Australia has been divided into counties, the area being less than one third of the state. The year of proclamation and general location are included. Use <Ctrl+F> to find a hundred in this list. Property Location Browser — select hundreds from the layers drop-down list to display sections as well as hundreds. Also select any other features you require to be shown.